When I met Kirstin Green outside of the library prior to attending the class she’s leading at Sharp Coronado Hospital I had no idea I was in for such a treat. While we chatted and sipped our breve lattes, I felt privileged to be in the company of someone who has been a major contributor of much of the beauty in the form of art scattered around Coronado including steps at the high school, walls at the Brian Bent Memorial Aquatics Complex, walls of the restroom structure at Spreckels Park and walls at the Coronado Golf Course. 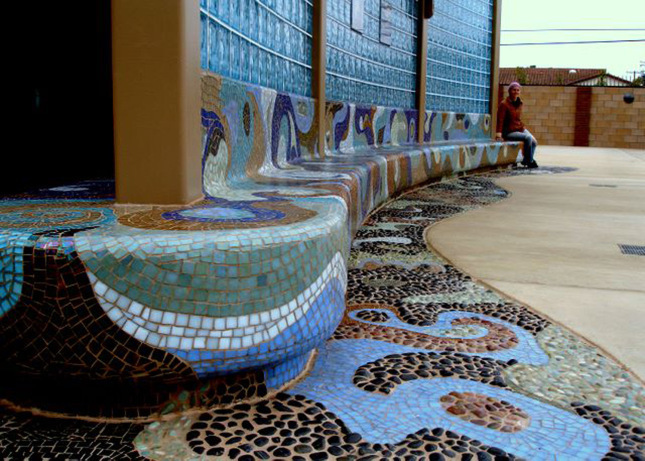 Her mosaics have transformed ordinary spaces into extraordinary works of art for public enjoyment. Not only is Kirstin talented beyond words, her heart and soul are kind and beautiful. Her passion for life, travel, art, and peace is evidenced on her website. Kirstin is a hometown girl. Born at Sharp Coronado Hospital long before it was the size it is today; it’s also the place her mother worked in the ER for over 50 years while her father has been the Coronado High School head coach for track and cross country for nearly as many years. On the day we spoke Kirstin was deeply saddened and grieving the loss of her dog of 16 years, Nana Mensah, who she adopted while serving in Ghana with the Peace Corps. She cried as she told me about the beautiful connection they shared. I was honored to hear the love she had for Nana. 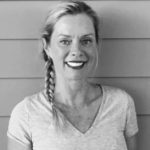 Her vulnerability and openness led to the conversation of the project she is currently working on at Sharp Coronado Hospital for their new healing garden. A 9’ by 9’ mosaic mural she is designing and creating is due to be unveiled this summer. 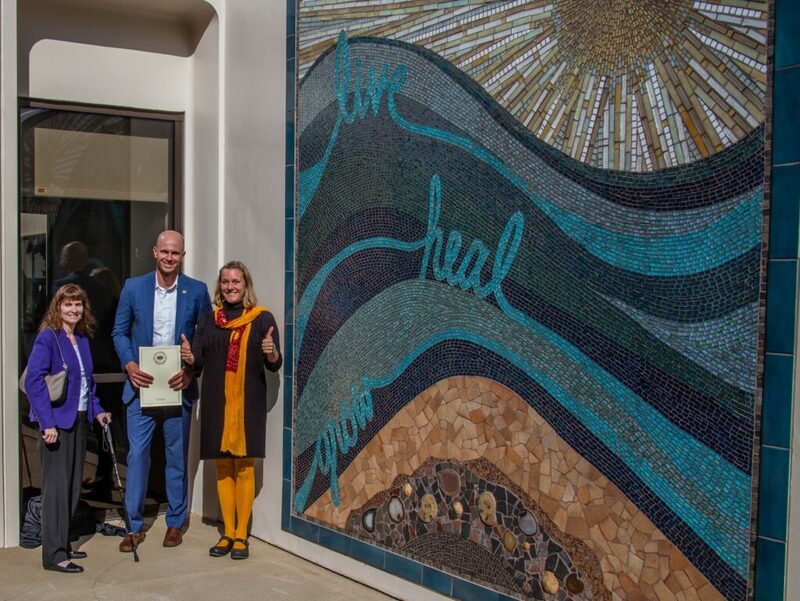 When Sharp Coronado CEO, Susan Stone, reached out to Kirstin to the do the mural, Kirstin accepted with the condition that she be able to host some classes at the hospital to gather inspiration of what healing looks like from people within the Coronado community. She wants to make sure this project fosters community and draws in a sense of ownership with community input and involvement from which her inspiration will be drawn. 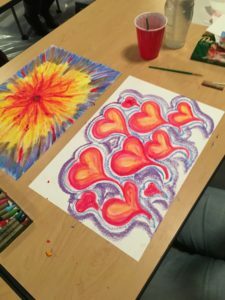 Her hope is to gather the art from 50 or more community members of all ages, and then process the pieces looking for themes and patterns of what healing looks like. Just like the piece she created in the class I attended as she is processing her loss and looking to transition to healing. I attended and participated in one of the classes. Most of the 6 or 7 of us in the class I attended weren’t exactly sure what we were showing up to do, but we were all intrigued. Kirstin explained to us that she is in a Masters degree program for Expressive Arts Therapy and this class would not only guide us from what grief or suffering felt and looked like, to what healing feels and looks like for her inspiration on the wall project, but also be part of the type of work she will do upon completion of her degree. Kirstin obtained her undergraduate degree in photography and art from San Francisco State University. 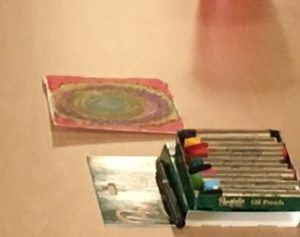 We were not working with mosaics, but instead, she gave us all a package of Portfolio water soluble oil pastels, some paper, paint brushes and cups of water. To begin with, she prompted us to experiment with the pastels, which when put to paper felt like soft crayons but when brushed with water became watercolor-like. The prompt was to think of something which had caused us pain and draw what that felt like. We then went around and briefly explained why we drew/painted what we each did. Next was the big paper, the real thing. The prompt was “what does healing look like?” We were given about 45 minutes to create on an 11”x17” piece of paper. The creations were all very unique and each had a beautiful story of transformation or purpose. Kirstin collected all of the work and will add these to the pieces from previous classes. 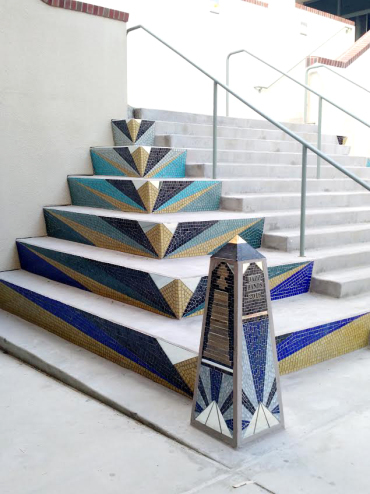 She hopes to have all of the work displayed in the halls of the hospital during the time of the healing garden mosaic unveiling, with the permission of each artist. Because of her dog Nana’s passing, there was a canceled class for which she apologizes and an additional class has been added to work toward gathering the fifty pieces. 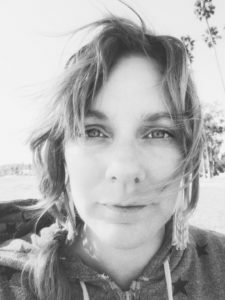 Kirstin invites you to attend this free class and participate in offering inspiration for the creation of something which will provide solace, peace, and be healing to many for generations to come. Please join Kirstin and lend your art and feelings by signing up by clicking here for the last currently scheduled class. The class will be held on Thursday, February 1, 2018, from 4-6pm at Coronado Sharp Hospital Sandermann Auditorium, 250 Prospect Place, Coronado, CA 92118. You may also register by calling the hospital and asking to register for the community art forum class 1-800-82-SHARP (1-800-827-4277). 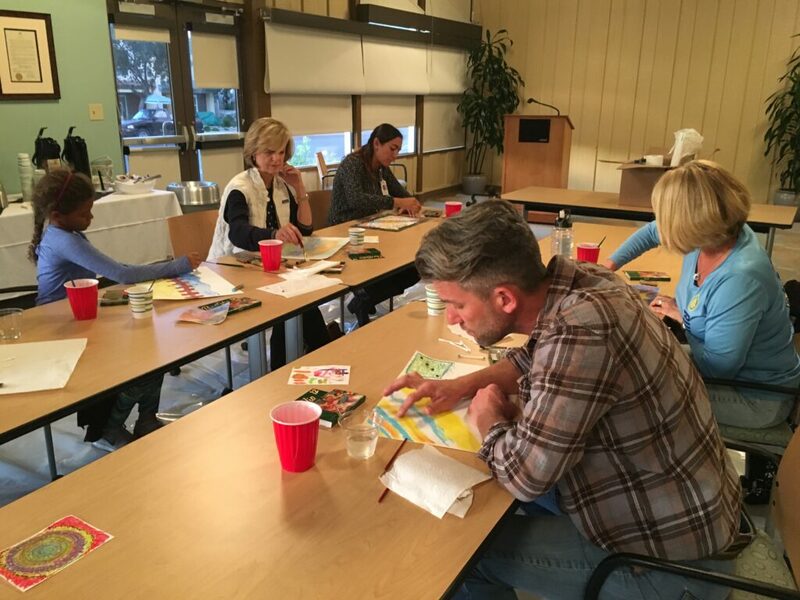 Kirstin also teaches Introduction to Mosaics for adults through the adult education program, you can get more information on enrolling in the next class here. You don’t want to miss the opportunity to be part of this project and spend time with Kirstin as she continues to beautify our community with love, meaning, and artistic beauty. Councilmember Carrie Downey, Mayor Richard Bailey, Kirstin Green. 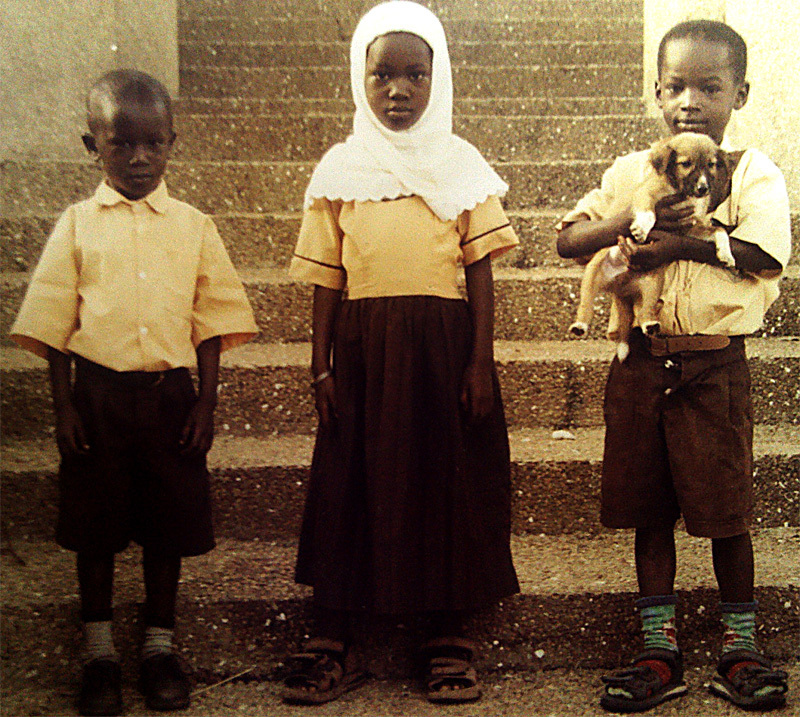 Photo by George Green.